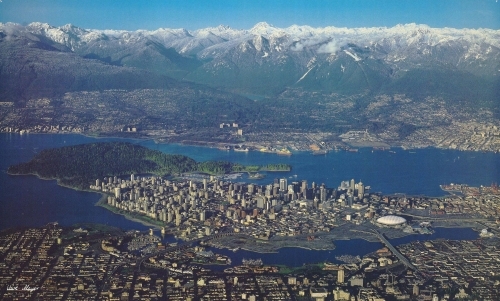 Toronto to Vancouver - $409 roundtrip including taxes, even during summer! WestJet has just dropped the price on a ton of their flights from Toronto to Vancouver. Typically this is a route where prices don't drop much below the $500s, and also a route where our nation's two airlines don't usually like to lower their prices. What's even more amazing is that summer travel dates are available, a time period where flights are generally even more expensive, and the airlines are most reluctant to drop their prices. Paying $700+ roundtrip for summer travel within Canada is common. 1. Just try a 3 day flexible day search on Kayak. Search for dates of travel between May 2015 through September 2015. You can see that the availability is wide open! 2. Click through from Kayak to WestJet's website to book. Update 1 - June 10 @ 2:30 PM EST - they're back! Today, these flights came back! Try a flexible date search on Kayak using dates from mid-July, up until early September. Click through from Kayak to WestJet.com to book. For live discussion of this deal, or to get some amazing travel advice from over 19,200 real travelers in Toronto, join the YYZ Deals Facebook Group. toronto, yyz, westjet, flight deals, vancouver, british columbia, canada, bc, north america and western canada. 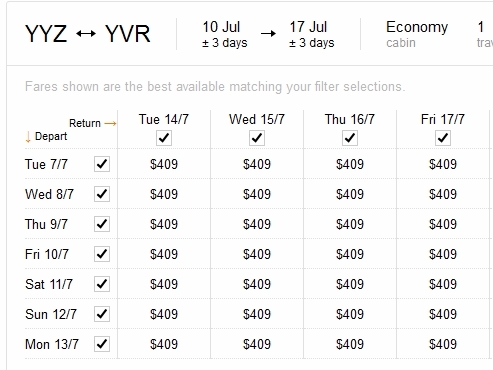 No Responses to "Toronto to Vancouver - $409 roundtrip including taxes, even during summer!"